Fans of The CW's Arrow and The Flash will be without their beloved shows for the next two weeks, but the wait will certainly be worth it since they both come back with an epic crossover event, airing Tuesday, December 1 and Wednesday, December 2. To help fans cope with this excruciating anticipation, The CW has released a new trailer for The Flash portion of this two-night event, Legends of Today, which gives us new insight into the villainous Vandal Savage (Casper Crump). This latest footage shows that the immortal Vandal Savage is tracking down Kendra Saunders (Ciara Renee), a.k.a. Hawkgirl, a "reincarnated warrior priestess." As it turns out, though, Kendra doesn't remember any of her warrior priestess past, claiming she grew up in Wisconsin. But Carter Hall, a.k.a Hawkman (Falk Hentschel) reveals that her memories will eventually come back to her. Unfortunately, we don't know much about why Vandall is seeking out Hawkgirl, but it's clear that he'll destroy Central City while doing so, leading to both Arrow and The Flash teaming up once again. We also get another glimpse of Hawkgirl taking flight, which could be one of this crossover's most memorable moments. After Vandal attacks Kendra and Cisco (Carlos Valdes) in The Flash episode Legends of Today, they turn to Barry (Grant Gustin) for help. Realizing how dangerous Vandal is, Barry takes Kendra to Star City and asks Oliver (Stephen Amell) and team to hide her until he can figure out how to stop Vandal. However, things quickly go from bad to worse when a man with wings, AKA Hawkman (guest star Falk Hentschel), shows up and flies off with Kendra. Meanwhile, Harrison (Tom Cavanagh) develops a serum to make Barry run faster and asks Jay (guest star Teddy Sears) to test it out. The Arrow half of the crossover, Legends of Yesterday, follows Oliver and Barry as they take Kendra Saunders and Carter Hall to a remote location to keep them hidden from Vandal Savage while they figure out how to defeat him. Malcolm (John Barrowman) arranges a meeting between Vandal, Green Arrow and The Flash that doesn't go as planned. Meanwhile, Felicity (Emily Bett Rickards), Thea (Willa Holland), Diggle (David Ramsey) and Laurel (Katie Cassidy) work with Team Flash to come up with a weapon powerful enough to destroy Vandal Savage. While we still don't know exactly when DC's Legends of Tomorrow will debut, this crossover will help set the stage for the midseason spinoff, since Vandal Savage, Hawkgirl and Hawkman will be featured in that series. It isn't known if other DC's Legends of Tomorrow stars such as Arthur Darvill (Rip Hunter), Franz Drameh (Jax Jackson), Victor Garber (Dr. Martin Stein), Caity Lotz (White Canary), Brandon Routh (Atom), Wentworth Miller (Captain Cold) or Dominic Purcell (Heat Wave) will be featured in the crossover, but we'll find out in just a few short weeks. 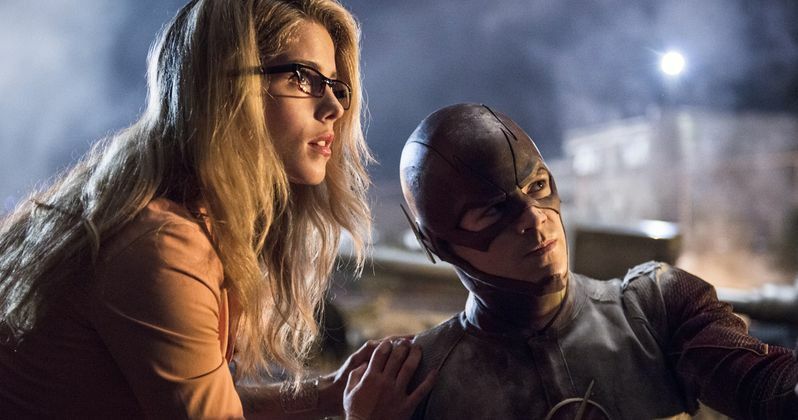 Take a look at this new trailer, and stay tuned for more on the Arrow and The Flash crossover.